Businesses – particularly SMBs that have limited resources – are struggling to cope with the ransomware threat. 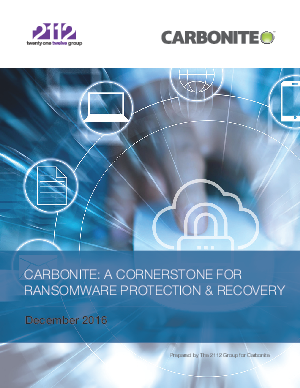 Carbonite’s data backup and recovery services are great for regaining access to data after a compromise, but they don’t help mitigate the potential for ransomware attacks. For that, your business needs a comprehensive approach to safeguarding devices and networks against ransomware, with backup and disaster recovery as the safety net – the last, best solution for recovery after data is corrupted.